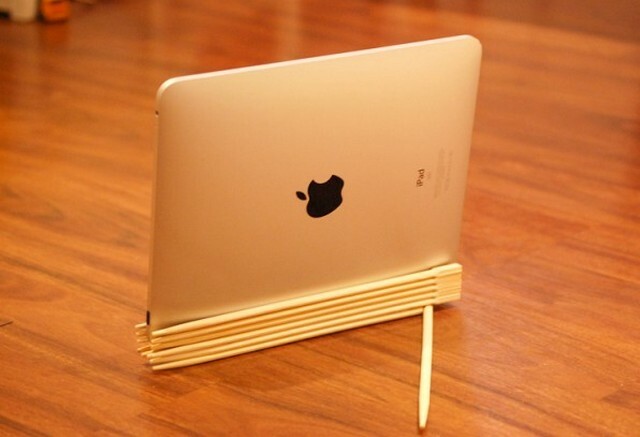 If you're looking for a cheap and clever way to prop your iPad up this iPad stand crafted from chopsticks is ideal for an iPad used around the kitchen. ReadyMade, a household-centric DIY magazine, shares an inexpensive little iPad stand you can make from stuff laying around the house. You'll need 13 chopsticks, a drill, a small bolt and some wood glue. When you're turn tinkering you'll have a sturdy little wooden stand with a chopstick kickstand that's more than ready to help hold up your iPad for recipe reading and more. Hit up the link below for step-by-step instructions.